One of the major objectives of the Council has been to improve the quality of education in our colleges and in view of this the Student Project Programme (SPP) was started during 1978-79 to sponsor engineering student projects. This innovative program has been playing a very important role in engineering education for last forty years and has become a flagship program of the Council. Innovation and technology are needed to transform our nation from reliance on exploitation of natural resources which are non-renewable and finite to technological innovation as basis for sustainable and all round development. Recognizing this need, the Council initiated the Student Project Program, popularly known as SPP, as early as 1977. The main purpose of this Program is to bring out the hidden talent and innovative spirit of young engineers graduating from colleges across the State. Under this Program, the Council has been providing both technical and financial support to selected projects undertaken by the final year engineering students of Visvesvaraya Technological University (VTU) and of other engineering colleges. Thus the Council has been playing a crucial role in building confidence and enhancing the capabilities of engineers graduating from the colleges in the State. So far KSCST has conducted 40 Series of events in the SPP, since its inception supporting more than 9000 projects for the Engineering and Science Students. Many projects, sponsored in this program, deal with technology applications which are relevant to the State. This process has been ably assisted by more than hundred faculty members of the Indian Institute of Science, NAL and experts from various other research institutions and government departments. The Student Project Program of KSCST has attracted the attention of educationists and technologists in the entire country. The work discipline acquired by students in evolving and executing their projects, improves their analytical method and technical capabilities enabling better performance as professionals. The sponsorship, by Karnataka State Council for Science & Technology, has become a benchmark of quality for engineering student projects and these projects have been highly valued by both academic and industrial communities. In this program, several completed projects have also been identified as promising and having commercial potential. Concerned faculty/students of such projects are encouraged to go ahead for further modification wherever required and to take-up field trials or for scaling up. Projects have always been diverse, reflecting the varied interests of the students/guides and some of them are found to be very innovative. SPP, when started in the year 1977-78, supported 81 projects, from 13 institutions. Today under the 41st Series of SPP, the Council received 2973 project proposals from various disciplines from over 145 engineering colleges in the State. These project proposals were scrutinized by experts from Indian Institute of Science, NAL and other institutions who have approved 598 project proposals from 140 engineering colleges under this 41st Series of SPP with a grant support of Rs. 34 Lakhs. As per the recommendations of the subject experts, SPP project proposal thrust areas information were sent to all engineering colleges and updated in KSCST website. The following were the thrust areas recommended by the experts to submit the student project proposals for the 41st series of SPP. SPP Website contains, in addition to thrust areas, format of the proposal and other relevant details. Posters were sent to all the engineering colleges of the State and Universities, indicating last date for submission of the project proposals. Experts during evaluation had reviewed the methodology and the interim output of the projects. The students had demonstrated their progress of the projects at the nodal centers. A total of 342 projects were selected for Seminar and Exhibition (144 Seminar and 198 Exhibition) from 118 Engineering colleges in the state. The SPP Co-Ordinator and Principal of respective engineering colleges have been informed about the selection of the projects for Exhibition/Seminar from their institutions. CONSTRUCTION TECH., MGMT.& HIGHWAY TECH. MECHANICAL& ELECTRONICS AND COMM., ENGG. Council and Karnataka State Bio-energy Development Board (KSBDB), GoK are jointly supporting B.E, M. Tech, M.Sc., and MBA students to take up research projects in the Biofuel / Bioenergy area. KSCST & KSBDB, had sent a poster consisting of thrust areas for students to take up project. KSCST received 154 student project proposals (111 BE projects, 9 M.Tech projects, 24 M.Sc., projects and 10 MBA projects) from various colleges across the state under SPP Biofuel / Bioenergy area (Annexure 2). These project proposals were evaluated by the experts and they have selected 87 projects for the sponsorship (62 BE projects, 3 M.Tech projects, 16 M.Sc., projects and 6 MBA projects). The nodal centre evaluation of Biofuel projects was held at Sri Venkateshwara College of Engineering, Bengaluru on 25th May 2018. A total of 62 projects were selected for Seminar and Exhibition. The Council is organising the 41st Series Seminar and Exhibition on 10th and 11th August 2018, at Bapuji Institute of Engineering and Technology, Davanagere. The programme was inaugurated on 10th August 2018 at 10.30 AM by Dr. S. Rajashekharaiah, Former Vice Chancellor, Visvesvaraya Technological University, Belagavi. Ms. K. M. Jaanaki, IAS, Managing Director, Karnataka State Bioenergy Development Board, Government of Karnataka released the SPP Biofuel Compendium. Shri. Kunal Satyarthi, IFS, Member Secretary, Himachal Pradesh Council for Science, Technology and Environment, Shimla, Prof. S. Subramanian, Secretary, Karnataka State Council for Science and Technology were the Guests of Honour and addressed the gathering. Shri. A. C. Jayanna, Chairman, BIET and Treasurer, BEA presided over the function and released the SPP Engineering Compendium and Compact Disc containing abstracts of Projects. Dr. S. G. Sreekanteswara Swamy, Executive Secretary, KSCST, Dr. S. Subrahmanya Swamy, Principal, BIET, Davangere and Prof. Y. V. Vrushabendrappa, Director, BIET, Davangere were present on the occasion. In this Series of SPP 144 Engineering and 51 Biofuel projects have been selected for Seminar and 198 Engineering projects and 11 Biofuel projects have been selected for Exhibition. These Seminars and Exhibits will be evaluated by a panel of experts consisting of scientists and engineers from Indian Institute of Science and National Aerospace Laboratories, Bengaluru and other research organizations. Some of these selected projects will be awarded as best projects of the year and the best performing college will also be awarded. The awards will be presented during valedictory function. In addition to the above a special lecture has also been arranged during this program. Dr. Mayank Shrivastava, Professor, Department of Electronic Systems Engineering, Indian Institute of Science will be delivering technical lecture on "The Role of World Electronics and Possible Role India Can Play" on 11th August 2018 between 12.00 to 1.00 PM. The focus of the seminar and exhibition is not only to provide the forum for the students to present their work, but also to educate them on current developments in the field of engineering and technology. The exhibition is also open for students and general public on these days. The Valedictory program and Awards Presentation function of this Seminar and Exhibition was held on Saturday, 11th August 2018 at 3.00 PM at Bapuji Institute of Engineering and Technology, Davanagere. Dr. H. Honnegowda, Special Director (Technical), Department of Science and Technology and Managing Director, Karnataka Science and Technology Promotion Society, (KSTePS), Government of Karnataka was the Chief Guest of the Valedictory function. Er. Ravinder Gaur, Scientist and Member Secretary (State S&T Programme), Technology Development and Transfer Division, Department of Science and Technology, Government of India, New Delhi was the Guest of Honour. Shri. A. C. Jayanna, Chairman, BIET and Treasurer, BEA presided over the Valedictory function. Prof. S. Subramanian, Secretary, Karnataka State Council for Science and Technology, Dr. S. G. Sreekanteswara Swamy, Executive Secretary, KSCST, Dr. S. Subrahmanya Swamy, Principal, BIET, Davangere and Prof. Y. V. Vrushabendrappa, Director, BIET, Davangere were present on the occasion. A total of 52 projects were adjudicated as best Project of the Year and were awarded. 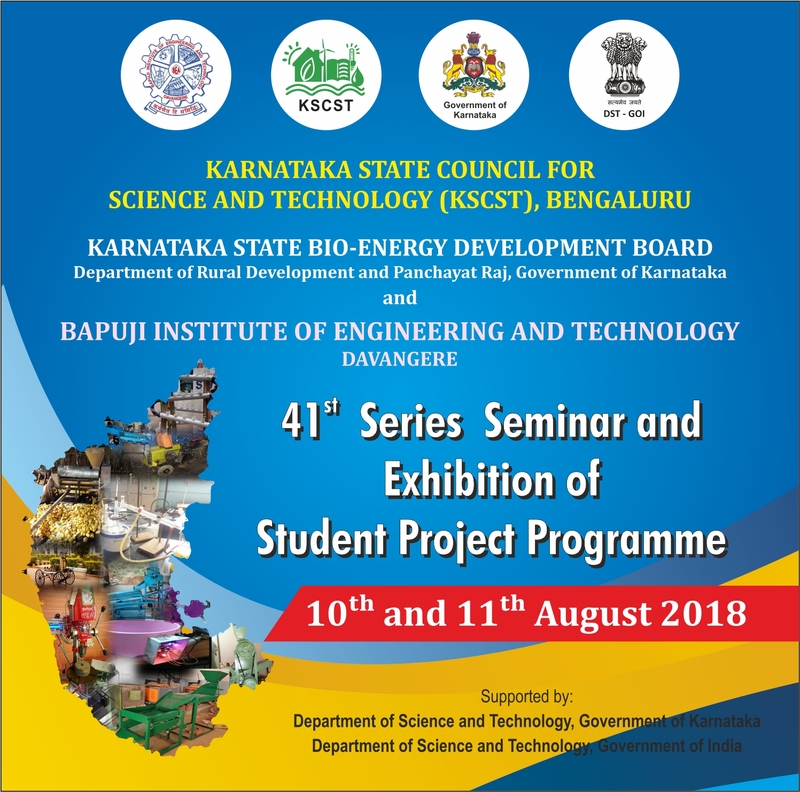 41st SERIES OF STUDENT PROJECTS PROGRAMME : 2017-2018 - State Level Seminar and Exhibition of selected projects will be held at Bapuji Institute of Enginering and Technology, Davangere on 10th and 11th August 2018. Click on this link for Details of Projects selected for S/E.